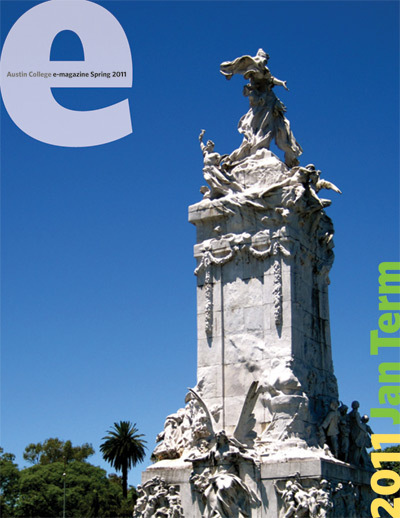 The Spring 2011 e-issue of Austin College Magazine contains information on a number of campus happenings, from continued construction to sports highlights. A favorite of alumni, JanTerm continues to provide special opportunities for students to discover new interests, explore career options, complete independent research, and make tremendous memories in study around the globe. Take a look at the agenda for a day greatly anticipated by members of the Class of 2011. In January, the Austin College ACtivators celebrated its 500th ministry event. Meet Lisa Fain, living in New York, but hungry for Texas cuisine—until she began to create her own. The Austin College community mourned the loss of a Class of 2014 student this winter. An “Insider’s” Look at the Middle East by Michael Dorsey ’02.